A battery is used as a secondary power source in automobiles. An electric vehicle battery is a secondary (rechargeable) battery. It uses chemical energy stored in rechargeable battery packs for power and therefore does not require any combustion engine for propulsion. An electric vehicle battery or traction battery powers the propulsion of battery electric vehicles in the market. In the recent years, consumers are more inclined toward battery electric/plug-in vehicles, because these vehicles run without fuel, such as petrol, diesel, and gasoline and have lower maintenance cost, which eventually reduces consumers’ expenses. According to the statistics provided by the German Federal Motor Transport Authority, there is 61% increase in the plug-in EV (electric vehicle) sales in 2018 as compared to that in 2017. Thus, environment-friendly nature of electric vehicles drive the growth of the electric vehicle battery market. The emergence of Lithium-ion technology has fueled the growth rate for batteries over the last two decades. While initial hybrid vehicles used Nickel Metal Hydride (NiMH) batteries, Li-ion batteries have been the primary solutions for automakers to power plug-in hybrid electric vehicles (PHEVs) and battery electric vehicles (BEVs). High-energy density, charge retention capacity, and low maintenance are some of the benefits that have accelerated the growth of Li-ion as a battery technology. Automobile manufacturers introducing BEVs and PHEVs in the market are further enhancing the technology and are anticipated to offer Li-ion powered solutions as a primary power source in their vehicles. Increasing global concerns regarding the negative effect of climate change along with alarming pollution levels recorded in the major cities have created a significant demand for electric vehicles. A major factor behind the growth of electric vehicles is the support provided by the various governmental agencies to encourage the sale of these vehicles. This factor has driven the growth of the electric vehicle battery in the market globally. The growth of the electric vehicle battery market is driven by rise in the demand for zero-emission vehicles, decrease in the cost of the electric vehicle battery system, and increase in the global awareness regarding climate change. However, stringent lead pollution norms in electric vehicle battery may hinder the market growth. In addition, high import taxes on EV batteries and instability in raw material prices are expected to limit the market growth. Furthermore, evolution of Lithium-ion technology in EV battery and growth in public charging infrastructure offer lucrative opportunities for the market. The key players profiled in the report include Panasonic, AESC, BYD, Mitsubishi, LG Chem, Samsung, Wanxiang, Beijing Pride Power, Tianneng, and SB LiMotive. The global electric vehicle battery market is segmented based on vehicle propulsion type, battery type, vehicle type, and region. On the basis of vehicle propulsion, the market is divided into battery electric vehicle (BEV) and plug-in hybrid vehicle (PHEV). The various battery types are Lead-acid, Nickel metal Hydride, and Lithium-ion. Passenger car and commercial vehicle are the two vehicle types. Based on region, the market is analyzed across North America, Europe, Asia-Pacific, and Latin America Middle East and Africa (LAMEA). 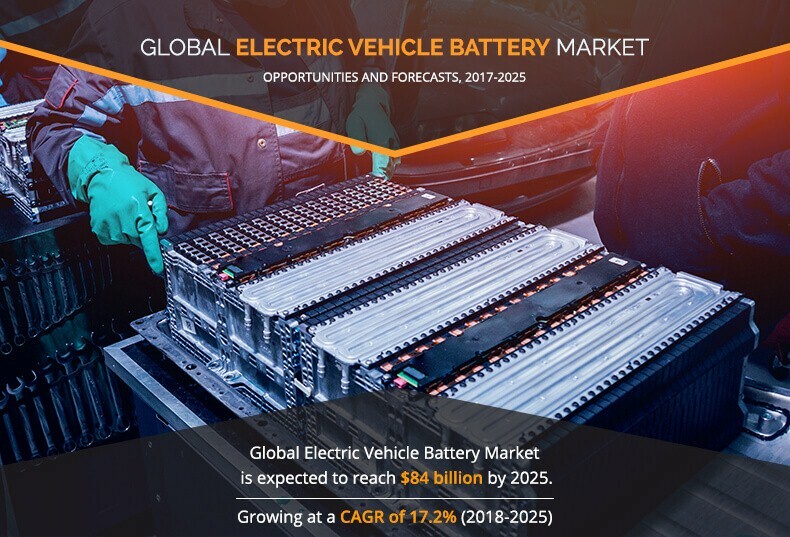 The soaring demand for zero-emission vehicles, advancing evolution of Lithium-ion technology, and rising government regulations on emission control systems are the significant factors that affect the growth of the global electric vehicle battery market. These factors are anticipated to either drive or hamper the market growth. Widespread global concerns regarding the negative effect of climate change along with alarming pollution levels recorded in major cities have created a significant demand for electric vehicles. The rise in petrol and diesel prices has added to the demand for fuel-efficient vehicles. This rise in fuel prices is due to depletion of fossil fuel reserves and growth in tendency of companies to gain maximum profit from these oil reserves. All these factors have cumulatively shot up the need for advanced fuel-efficient technologies, leading to a surge in demand for electrically powered vehicles for travel. Automobile companies focus on the production of advanced electric vehicle battery systems that are expected to have lower emission at relatively lower costs as compared to heavier and larger engines. Compactness and cost-effectiveness are other useful features of this battery Thus, development of technological advancement in the electric vehicle battery system presents various opportunities for leading players in the future. This study comprises an analytical depiction of the global electric vehicle battery market with current trends and future estimations to depict the imminent investment pockets. The overall market potential is determined to understand the lucrative trends to gain a stronger foothold in the electric vehicle battery industry. The current market is quantitatively analyzed from 2017 to 2025 to highlight the financial competency of the global electric vehicle battery market. 8.4. SAMSUNG ELECTRONICS CO. LTD.
Lithium-ion battery is gaining popularity because it has high density and light-weight, provides better acceleration, requires lesser maintenance, and causes lesser harm after disposal. The energy density of this battery is typically twice the standard of Nickel-Cadmium. Its self-discharge is lesser than half of other batteries, making it well-suited for modern fuel gauge application. Asia-Pacific is the most dominant region in the EV battery market. China is much advanced in the EV battery technology as against North America. China has abundant reserves of Lithium, which makes it a major player in the Lithium-ion battery manufacture. An increase in vehicle population and a rise in vehicle standards fuel the growth of the Asia-Pacific EV battery market. 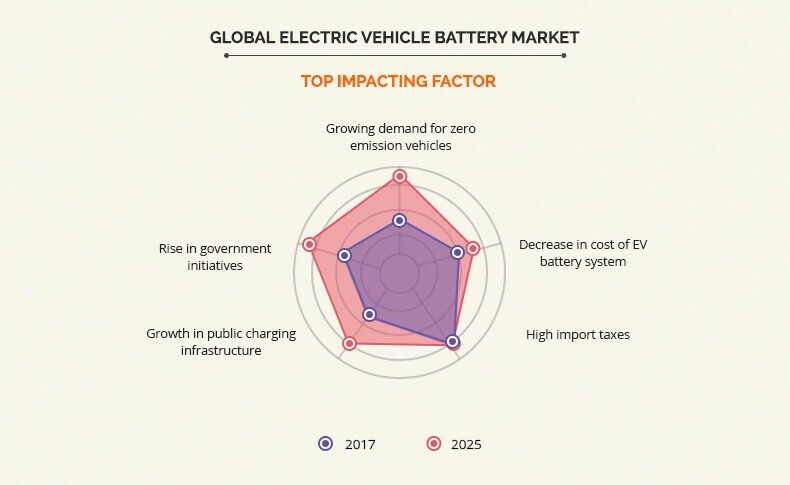 Moreover, various technological advancements are taking place related to electric vehicles, owing to government initiatives, which further propels the growth of the electric vehicle battery market in the Asia-Pacific region. Panasonic, AESC, BYD, Mitsubishi, LG Chem, Samsung, Wanxiang, Beijing Pride Power, Tianneng, and SB LiMotive are key players that occupy a significant revenue share in the global electric vehicle battery market.